In June of 2018 I was offered the opportunity to join Clearly Agile as an Enterprise Agile Coach. My first assignment was a long-term stint embedded with PricewaterhouseCoopers serving as the dedicated onsite Agile Coach for a multi-million dollar initiative. This assignment included coaching teams in the Scrum methodology and various other Agile and Scrum techniques (user stories, backlog management, estimation, etc. ), scaling one large team into multiple, right-sized teams, active planning tool configuration and much, much more. In November of 2015 I was delighted to join AshComm, the eCommerce arm of Ashley Furniture responsible for the development of ashleyfurniturehomestore.com. I was tasked with spearheading their adoption of Scrum. This was a herculean task and an absolutely amazing opportunity to help a world-class organization achieve even higher levels of excellence with their eCommerce development efforts. As a result of my work in AshComm I was later transitioned over to Ashley’s enterprise-wide Agile Transformation Team as one of only two Enterprise Agile Coaches. I also served as the lead Scrum Trainer, lead Agile Product Management SME, and lead Scaled Agile (SAFe) SME. In this role, I trained and coached over 25 software delivery teams across more than 8 business units. I started at LabTech Software in November 2010 as their Online Documentation Specialist, responsible for migrating over 375 pieces of web content, then maintaining that online user documentation and the CMS it which it resided. In addition to posting, editing, and maintaining all of our online end-user documentation, I also oversaw all major CMS component changes, integrations, and development. As time passed, I also found myself performing all daily website administrator duties and acting as the point of contact for our online user experience. In August 2011, I was promoted to Manager of Web Services where I built and managed a team of four developers responsible for overseeing all non-marketing aspects of labtechsoftware.com and its subdomains; including new web application design and development, business process automation, weekly web site maintenance, and web server administration for almost a dozen web servers. In April 2013 I was given the opportunity to become the company’s first Web Product Manager. My duties now focus largely on gathering requirements for new web innovations, enhancing our web user experience by serving as our user advocate, and performing the product owner role on our internal web development team. After successfully improving the LabTech Partner Portal over the course of 2014, in April 2015 I was given the opportunity to bring my knowledge and expertise to the Web and Mobile Control Center modules of our core product. I started at Knowledge Accelerators (formerly PCHowTo) in Sep 2005 as a technical writer responsible for scripting “how to” videos for end users for a wide variety of computer applications and VOIP telephone systems, including Internet Explorer, Microsoft Office, Lotus Notes and Avaya and Cisco VOIP telephones. After establishing a record of high performance as a technical writer in 2006, I was moved to knowledge base content management where I managed the maintenance of all content on IBM’s internal self-help website, IT Help Central until Jan 2009. After creating Hermes, a proprietary software application that increased our translation and delivery capacity by a factor of 2-3 times, I was then moved into the Senior Technical Writer position, training other technical writers who were working on multimedia end-user self-help content for the Lotus (Quickr, Connections, iNotes, Symphony) and Microsoft Office 2010 application families. Boson Software specializes in web-based test preparation, mainly for IT certifications. I paired with Boson to broaden their offerings to include practice exams in multiple subject areas and languages for the Praxis Series Teacher Exams, the SAT I, and the SAT II. I researched and designed 6 practice tests and worked with Boson editors and sales personnel to maintain my tests and provide valuable author interaction with our customers. Sales of my tests doubled yearly from 2003 to 2005, with my 2005 yearly sales measured in the thousands of dollars. Work history prior to 2003 was spent in the field of EFL/ESL education and is available upon request. Ability to gather, interpret, and document requirements for website and web application development. Well versed in inbound (technical) web product management, client and cross-team interaction, writing software requirements (user stories) and prioritizing features. Certified by the International Scrum Institute as a Scrum Master (SMAC), Scrum Product Owner (SPOAC), Scrum Coach (SCAC), Scrum Trainer (STAC), and Scaled Scrum Expert (SSEAC). 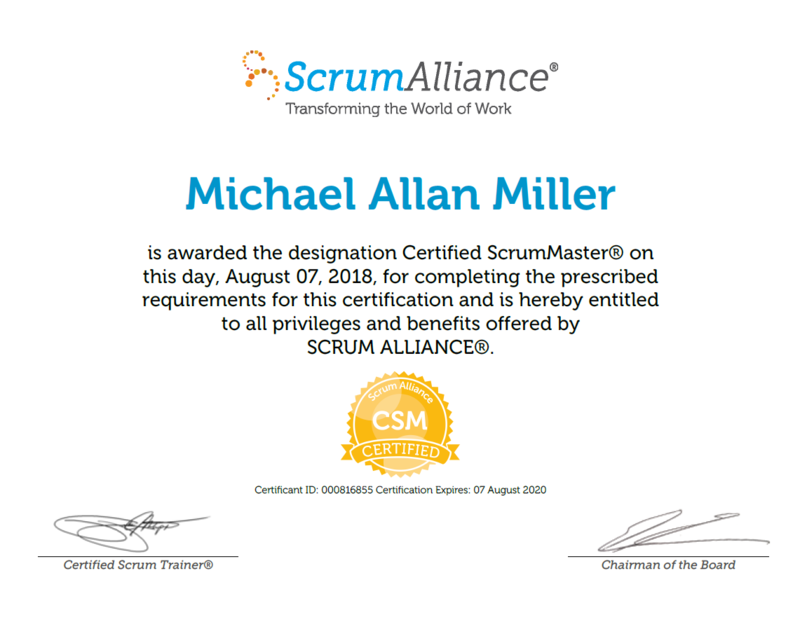 Certified by the Scrum Alliance as a Certified Scrum Master (CSM). Able to organize, create, run, and mentor Scrum teams (Product Owners, Scrum Masters, Developers), practice single and multi-team Scrum (parallel and scaled Scrum (Scrum of Scrums model). Ability to manage both web and mobile site/application development using Scrum. 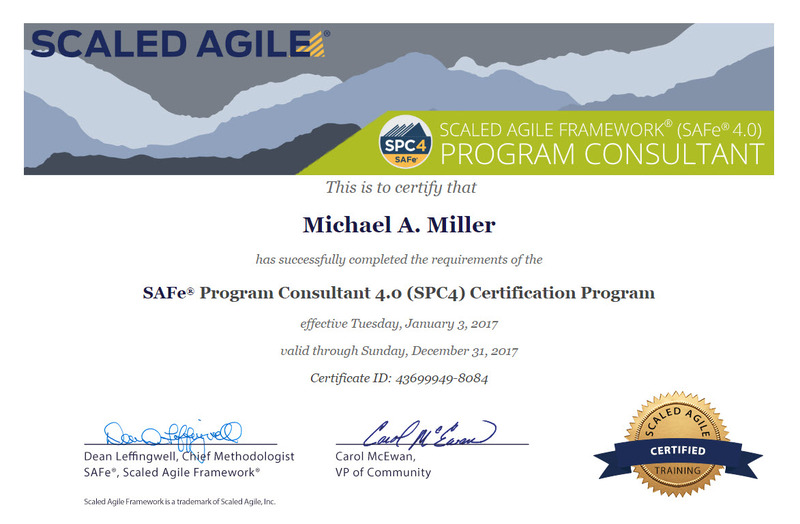 Certified by Scaled Agile, Inc. as a Scaled Agile Framework (SAFe) 4 Program Consultant (SPC4). Certified to teach all lower level SAFe classes and roles, including classes for certification for SAFe Agilist (SA), SAFe Practitioner (SP), and SAFe Product Manager/Product Owner (SPMPO). Certified to teach SAFe 4.0 & 4.5 and lead 3 and 4 level SAFe implementations at the enterprise level. Skill in the administration of Atlassian’s JIRA (3+ years) and Microsoft’s Visual Studio Team Services (VSTS) (1+ year). Ability to organize and management web content in the CMS environment. Skilled in installing and maintaining a wide variety of CMS web sites, including WordPress, Joomla, PHPKB, and more. Highly skilled in creating text, HTML, and multimedia how-to and instructional content for end users. Ability to create and manipulate intermediate CSS styles. Ability to create, manipulate, and execute basic queries, as well as edit existing queries.